I never saw Jurassic Park 3 in the cinemas for some reason so the first time I actually saw it was when I bought it on DVD. Unlike the previous two Spielberg-directed films in the series, Jurassic Park 3 was directed by Joe Johnston (Honey, I Shrunk the Kids, Jumanji) who originally wanted to direct The Lost World but Spielberg agreed to let him direct the third one. Dr. Alan Grant (Sam Neill) returns to the movie. We see him working at a dig site with his new colleague Billy Brennan (Alessandro Nivola). 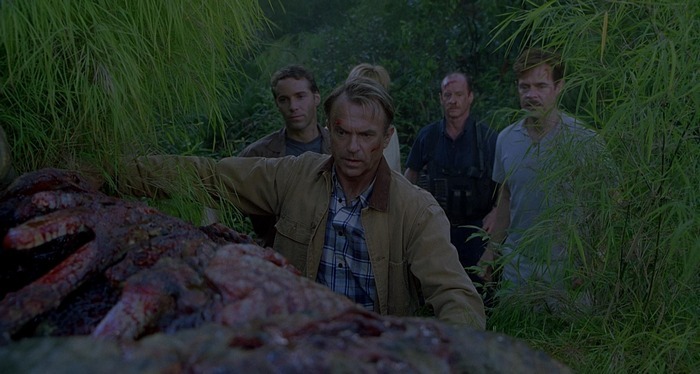 Two so-called billionaires called Paul (William H. Macy) and Amanda Kirby (Téa Leoni) convince Grant and Billy to give them a tour of Isla Sorna and he later finds out that the real reason they are there is to find their lost son, Eric (Trevor Morgan). We also get a cameo appearance from Ellie (Laura Dern). It’s a fairly self-contained movie when compared to the previous two Jurassic Park films. The film was written by Peter Buchman, Alexander Payne and Jim Taylor and Jurassic Park 3 is the first one in the franchise not to be based on a novel. Author Michael Crichton did work with the writers to come up with a new story but left after he failed to come up with something that worked. Like The Lost World, some ideas were taken from the original novels. The scenes on the river and the Pteranodons were taken from the first novel for example. The film was shot in Hawaii like the previous movies and the scenery is just wonderful. Instead of the coniferous forest in The Lost World, we get a lush jungle. The story is fairly straight forward and predictable with very few surprises, I think and it quickly gets us from one action scene to the next. As the Tyrannosaurus had been the antagonist for the previous two films, they wanted a new creature to be the focus. 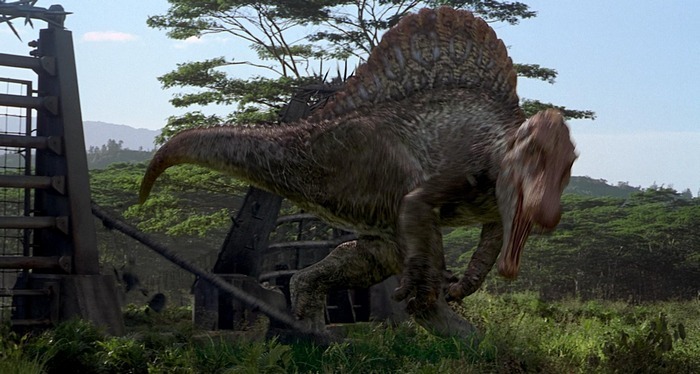 The filmmakers first considered using a Baryonyx or a Suchomimus but decided on a Spinosaurus because of its unique fin. The creature soon makes its appearance not long after the group land on Isla Sorna and spends most of film chasing them. A juvenile Tyrannosaurus does make a short appearance and has an epic fight with the Spinosaurus. Okay, so where do I start? At first, I was pretty disappointed they killed the Tyrannosaurus off who had sort of been the mascot of the previous films but I understand they needed to bring in a new creature to reinvigorate the series. Forgetting about the plot holes as to why the Spinosaurus keeps chasing the survivors all over the island, the biggest single problem for me is the visual and special effects. They’re terrible, to be honest which is surprising when this film was made 8 years after the original. As usual, animatronics were used for the close up shots and CGI was used for the full body movement shots. The problem is the animatronics just look completely fake, especially when compared to the previous Tyrannosaurus. It’s easy to notice when it kills Nash in the plane. Then the CGI doesn’t look all too impressive either. I think it’s possibly because the Spinosaurus appears in broad daylight for the first two encounters while the Tyrannosaurs generally only appeared at night in The Lost World and Jurassic Park. At the time though, I thought the T-Rex vs Spinosaurus fight was awesome when I first saw it and I considered it one of the best scenes in the entire franchise but the CGI does look very dated now. 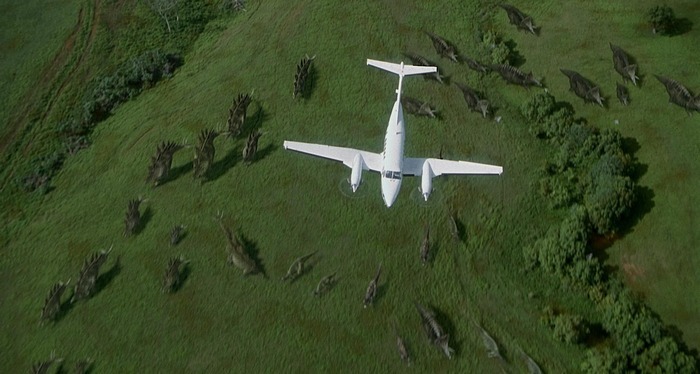 A Jurassic Park film wouldn’t be complete without the Velociraptors making an appearance. The film goes into much more depth about the Raptors than ever before. They’re shown to be much more intelligent than ever by actually setting a trap for the survivors. They injure Udesky in the jungle and cautiously wait for the others to come down from the tree. Dr. Grant speculates about a Velociraptor’s communication abilities at the start of Jurassic Park 3 and he’s proven right. They have advanced communication abilities with each other. In one example, we see one of the Raptors trapped in the laboratory actually calling the others for help. We also learn how protective they are over their eggs. They deliberately stalk the group until they recover the two stolen eggs. You might notice the Velociraptors look a little different in this film too. Due to recent palaeontology discoveries and theories, the filmmakers added quill-like feathers to the male Velociraptors. You can notice them on the back of their necks. The other new creature to make an appearance in Jurassic Park 3 is the Pteranodons. They did make an appearance right at the end of The Lost World but now they make a full appearance. When the characters escape the Spinosaurus, they wonder into a huge aviary containing the Pteranodons. I’m glad the filmmakers finally got them into an action scene and the animatronics and CGI is fairly impressive. Some other dinosaurs make minor appearances too including Ceratosaurus, Compsognathus, Brachiosaurus, Parasaurolophus, Corythosaurus, Triceratops, Stegosaurus and Ankylosaurus. The score was done by Don Davis, known for his work on the Matrix films after veteran composer John Williams was busy with other projects. The score is pretty much based on William’s previous work and even includes some of his tracks. I suppose you can call it a continuation of William’s work and it works quite well in the film’s action scenes. Forgetting about the previous films, there is a lot to like about Jurassic Park 3 and it’s certainly not as bad as some people say it is. We have new dinosaurs like the Spinosaurus and Pteranodons making proper appearances and we learn much more about Velociraptors. I think the problem is the filmmakers play everything too safe and it essentially becomes your typical Hollywood sequel. The length is a huge problem for me too. Jurassic Park and The Lost World were both at least two hours long and Jurassic Park 3 clocks in at 90 minutes. It’s just not enough time to develop a story like this and to learn more about the characters but on the plus side, the action flows quite nicely. There’s always something happening on the screen. I still prefer The Lost World over this one for its length and Tyrannosaurs’ appearance.